If you’ve been shopping with Autogeek for a long time, you know that our microfiber has traditionally come from Korea, where the quality of the fabric is outstanding. However, the Super Plush Deluxe Towel has caused us to take another look at China-produced microfiber. As you may recall, the Deluxe Towel was cut and sewn in China to save money on the production costs of what would otherwise be an expensive towel. We were very pleased to find that the quality of the towel was just what we’d expect if it was entirely made in Korea. So pleased, in fact, that we’ve purchased more towels from Chinese manufacturers. 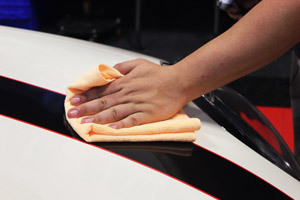 Use the Mango Breeze Microfiber Towels to buff away your wax or sealant with ease - they're perfect for use with your favorite quick detailer too! The Mango Breeze Microfiber Towels were a great find. They are a 80/20 blend of polyester and polyamide for extra softness. These towels have the same split weave as the rest of our microfiber, which gives the towel good absorbency. Mango Breeze Microfiber Towels are also perfect for using on interior surfaces because of the short, non-abrasive nap! We've seen the Mango Breeze Towels used for everything from cleaning (because the thinner fabric allows extra elbow grease where it’s needed), to buffing off spray waxes and quick detailers (the plush side is perfect for that!). They can also be used to buff off BLACKFIRE Tire & Trim Sealant or to clean up using BLACKFIRE APC All-Purpose Cleaner. Since the towels are so inexpensive, many don’t mind throwing one out if it gets really dirty. Plus, the bright color helps me keep these towels separate from paint towels. Just receIced these in the mail this week. Utter garbage. Holds no liquid and just pushes it around. For $10 I could have gotten double these on amazon. Not happy. Don't waste your money on these. I've used much better micro-fibers that are less expensive. Used Wizards Mist and Shine on a hood and it literally took an entire towel (folding, unfolding, swapping sides, etc) to wipe everything off with no streaks. ProsSoft enough that they won't leave scratches. ConsLint. Very thin. Don't hold moisture very well at all... basically just smears around whatever it is that you're trying to wipe off.